I am using Azure Service Fabric to host my application but I’ve deployed it on premises using a 3 machine cluster (running version Microsoft.Azure.ServiceFabric.WindowsServer.5.1.156.9590). It was easy to deploy and I only needed to run PowerShell on 1 of the nodes to configure up all 3. I followed the instructions here. From Visual Studio I deployed my application which consisted of a number of stateless services and a WCF service. When everything is running in the cluster it all works fine but I wanted to access the WCF service from outside of the cluster. The first issue was that the actual address of the service is not known but you can see the address if you look at the Service Fabric Explorer of the cluster. Navigating through to the application on one of the nodes returns the url of the service e.g. You don’t want to use this url directly as it could change depending upon the configuration of your cluster and the health of each of the nodes. 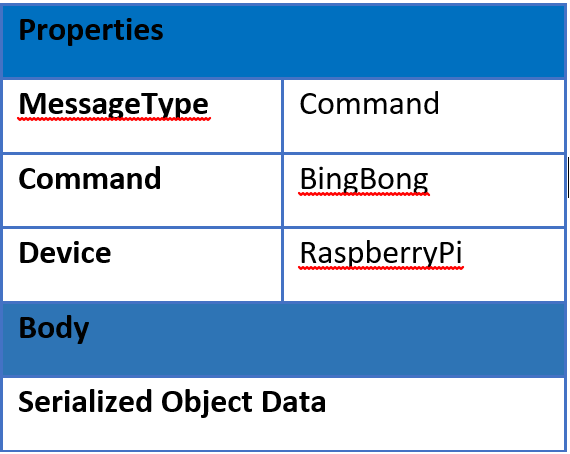 Service Fabric provides a mechanism for discovering the address of the end point using the Service Resolver. If you are running in the cluster then you can use the default resolver and this will return the url of the end point which you can connect to. However, when you are outside of the cluster you need to tell the resolver where to look for the cluster. Again if you look at the Service Fabric Explorer you can find out the ports used in the cluster e.g. The example here shows how to connect to the resolver in an Azure hosted environment. // create a  WcfCommunicationClientFactory object. However, when the code ran it always locked up on the call to InvokeWithRetry. On further investigation by calling ResolveAsyc first, I determined that may application was locking up when trying to resolve the address of the service. This took me a long time to figure out what was wrong and I tried a number of different addresses and ports with no luck. It was only after trying to run the code here, which lists all the services in a cluster, in the Visual Studio debugger that things started to work. This was confusing because I’d already tried loads of different things. The only difference was that the Development Service Fabric was running. I then ran my console app and no lock up occurred. Turning off the development service fabric and the console app locked up again. I moved the console app on to another computer that didn’t have the development service fabric installed and everything worked fine. Following on from my last post where I introduce Project Oxford I’ve done a bit more work to take the project that was built and make it more visual. To summarise, Project Oxford is a set of APIs that build on top of Azure ML to provide Face, Speech, Computer Vision and Language Understanding Intelligence Service (LUIS). There was a good video from Build 2015 that I watched to provide an overview of each of the APIs. I used the tutorials to build an application that would identify a number of people from a known list in a photograph and highlight the ones that were unknown. The Face API requires people to be trained with a set of photos first, before identification can be made. This was done by using the code in the samples. I created a folder for each person that I wanted to be trained and added different photos of each person with and without hats, and sunglasses and also with different expressions. Then each set of folders was passed to the training API. Once trained you can then use the rest of the Face API to firstly identify faces in a picture and then take each face that is found and see if they are known. One useful tip I’ve found is to have Fiddler running whilst you are debugging as it is far easier to see any errors in the body of the response message than in the exceptions that are thrown. Details of the errors can be seen in the Face API documentation. Note: The training does not last forever and you will need to redo it periodically. If you try and detect a person when training has expired then you will get an error response saying that the person group is unknown. Use the Identify Results to extract the names by calling Get Person. I wanted to emulate this and also to take it one step further. The data returned from the face detection API provides details about gender, age, the area (face rectangle) in the picture where the face was found, face landmarks, and head pose. What the detection API did not do was to tie the name of the person to the face. We do already have this information as it was returned from the Identify API and Get Person. The attribute that links them is the face id. Using the results of the Identify API I called get person for each face identified to return the person’s name and stored this in a Dictionary along with the face ID. This then allowed me to load the original photograph into memory draw the rectangles for each face and add the text below each using the face id to extract the rectangle and match the name from the Dictionary, This could then be scaled shown in the app. I’ve wanted to use Azure Machine Learning for a while but didn’t know where to start. Microsoft have released some gallery applications for Azure ML to take away some of the complexity and make it easy for developers to use the service. One item in the gallery that will be useful is Project Oxford. Project Oxford offers a number of features and the one I am going to talk about here is the Face API. With the Face API you can train Azure ML with pictures of a number of people and then use the matching api to see whether any of the trained people appear in the image. Login to Azure portal with an Azure subscription, The link should open market place. Scroll down to find Face APIs and then click through to the purchase button and purchase. This api is currently free. 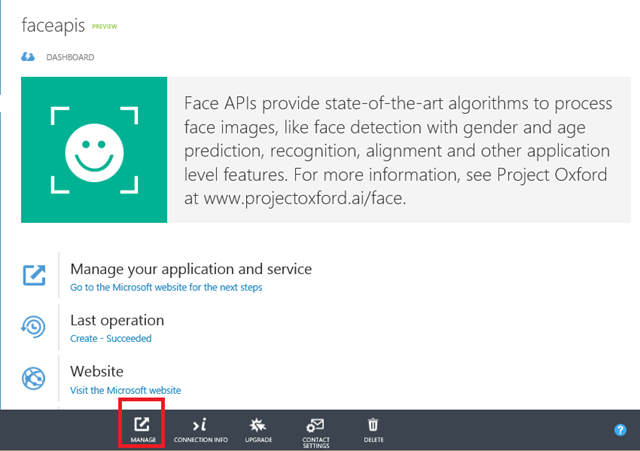 Download the face api from https://www.projectoxford.ai/sdk unzip and add to your project, then add a reference in your application. Be aware that when this is run you may get a bad request error (I used fiddler to see the error) when creating a Person Group. This seems to be due to case sensitivity and when I made the parameters lower case it worked! The sample code above is mixed case but the service seems to want all lowercase. Details of the error messages can be found here: https://dev.projectoxford.ai/docs/services/54d85c1d5eefd00dc474a0ef/operations/54f0387249c3f70a50e79b84 The body of the response contains the exact details of the error. Now I've added her into the training files she is not mistaken. You might need to play around with the training files especially to take into account hats and glasses. Last month Microsoft announced the Azure App Service (http://azure.microsoft.com/blog/2015/03/24/announcing-azure-app-service/). 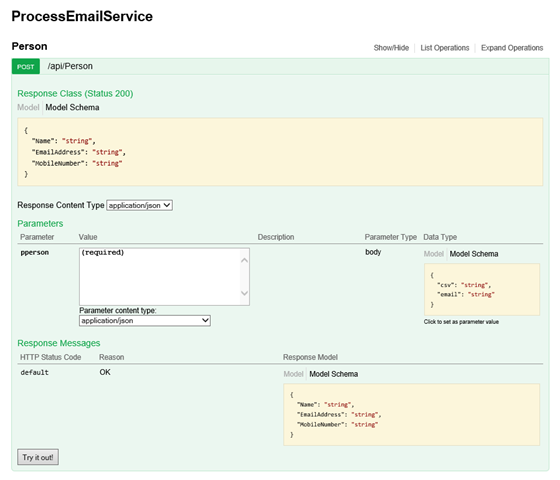 The App Service incorporates Web (sites) Apps and Mobile apps and introduces two new services: API Apps and Logic Apps. API Apps allows you to build small RESTful services that can be combined together with Web, Mobile and/or Logic apps to build your application. There is new tooling for Visual Studio (http://blogs.msdn.com/b/visualstudio/archive/2015/03/24/introducing-the-azure-api-apps-tools-for-visual-studio-2013.aspx) to help you build API apps, as well as providing the ability to debug your API App when it is deployed in Azure (http://azure.microsoft.com/en-us/documentation/articles/app-service-dotnet-remotely-debug-api-app/). API Apps are documented using Swagger (http://swagger.io/) and there is a UI in the portal to allow you to run the app with sample data. To access the Swagger UI click the API App URL in the portal and add \swagger to the end. Click on the API method you are interested in and then click the Action button (POST in my example below). This expands out to allow you to exercise the API. When you create an API app, especially if you created it from the market place (e.g. 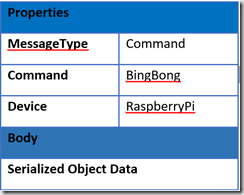 Azure Storage Blob Connector, Service Bus Connector etc) you are asked for configuration at the time of creation. Once it is created, it is not obvious where to find the configuration. In the new Azure Portal, Browse to API Apps and click on the one you want to reconfigure. In the Essentials panel that appears click on the API app host link. Click the settings Icon followed by Application Settings. Scroll down and any settings for the API App will be visible and can be changed. This is useful if you need to remember which service bus topic and subscription are configured for example. If you are unaware, older versions of the Azure Storage API will be turned off in December 2015. This means that any of your applications that use these older versions will stop working. If you are accessing the Storage API through an SDK then you most likely just need to rebuild with a newer supported version. If you are accessing the REST API directly then you will need to ensure that the code changes to support the newer API versions.